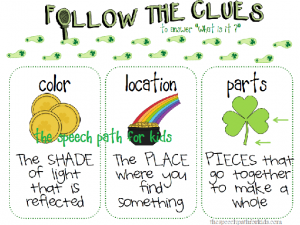 I really like taking my time exploring a unit or topic, so we have been having fun with leprechaun learning this week. 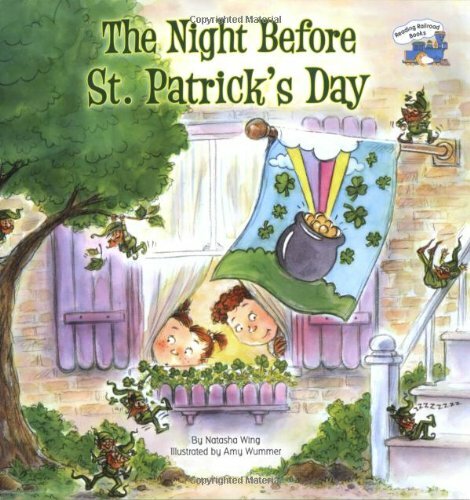 In my early language groups, we read “The Night Before St. Patrick’s Day” by Natasha Wing. 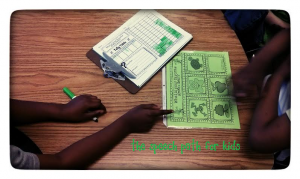 We explored the thematic vocabulary, actions, and the color green. A student led the questioning lesson! This week the question was to share our favorite green item. I push into three self contained classrooms for students with autism. One of the students loves the color green. 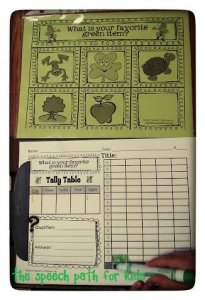 Every session he talks about green in some fashion…he wants the game cards that are backed with green paper, he requests the green scissors, he’s unhappy that our crafts are not green, or he notices I have on even a sliver of green. I was so excited that the question of the week was about the color green, so I decided to try to a new approach. I asked him to trade spots with me. He sat in my chair and completely led the question and graphing part of the lesson. It’s been modeled all year, so I didn’t need to teach him how. 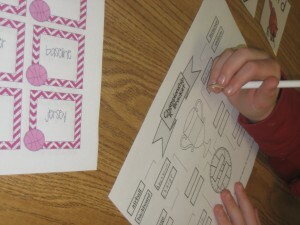 He was facilitating peer interactions to share interests, answer questions, use math concepts, and work cooperatively. 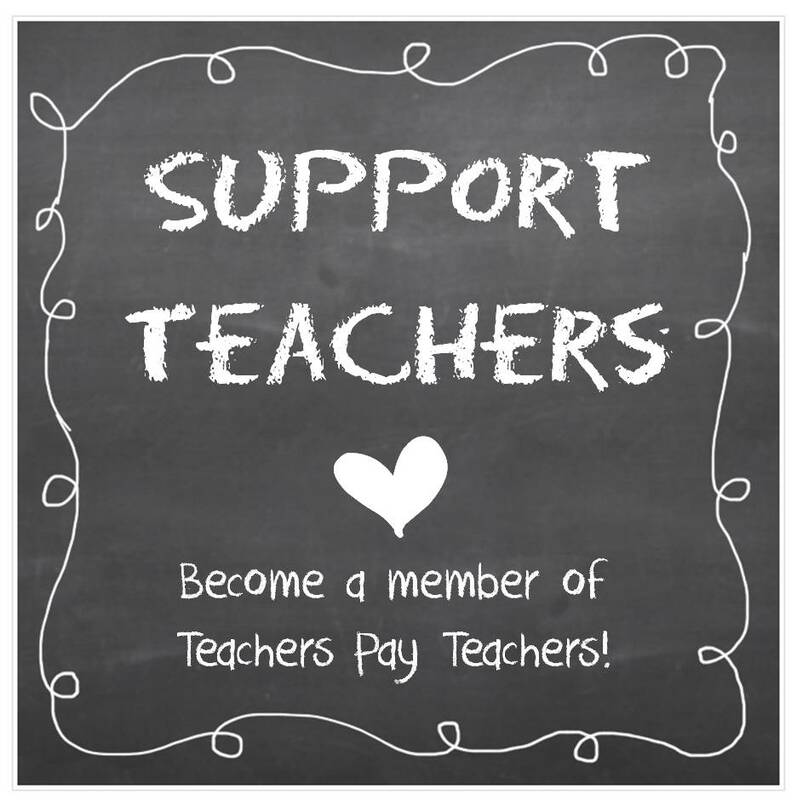 I thought I might cry right then and there…I truly love being an SLP! It doesn’t even sound fair to call it a “job”. I also realized that this is something I can do each week, rotating who gets to trade spots with me. 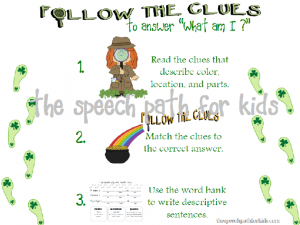 We worked on several goals within the “Follow the Clues: St Patrick’s Day” activity. 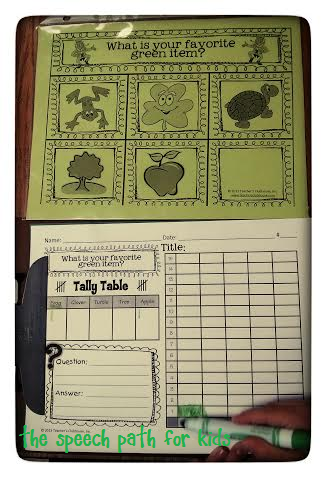 We used memory and listening strategies to listen to three descriptions (color, location, parts), then students tried guessing the item. I found that students really needed the pre-teaching of vocabulary from the story before attempting this. Every student started out just listening to the clues. 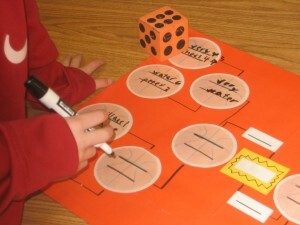 Some students needed visual answer choices. I built in extra support as needed using the visual choice board. This also doubled as visual cues while reading “The Night Before St Patrick’s Day”. One thing I love about getting comments on products is that I hear how people use the same product in multiple ways. One teacher left a comment about wanting a student direction page because she has independent learning centers. That was easy, so I added it! While I was in there, I decided I wanted to add another layer of support for students who need help knowing what it means to describe by color, location, parts. And the best part is, It’s a freebie! 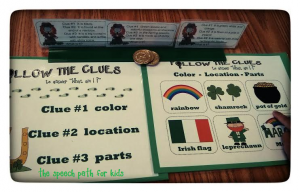 My 3rd-5th graders even joined in on the fun this week as we were using materials from WhitneySLP to learn about The History of St. Patrick’s Day. 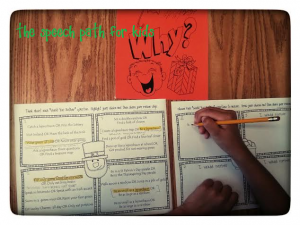 In those groups, we worked on narrative skills, comprehension, and justifying our reasons to answer “why” questions. We also wrote sentences and drew pictures to answer “Would You Rather” questions. 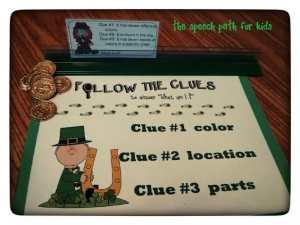 EVERY single one recounted stories about when they were in kindergarten or first grade and those pesky little leprechauns messed up their classrooms. They were recounting the details of the traps they had made and comparing them to the ones we saw in our stories. This magic was unfolding before my eyes… before we even got started on the true lesson. 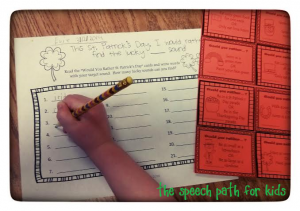 My articulation groups have been having fun searching for their sounds in leprechaun stories and “Would You Rather: St. Patrick’s Day” questions. I was surprised at how many thematic sh, ch, j sounds we brainstormed. Usually this is a hard group of sounds to find meaningful words.